April came in like March, very windy, but not quite as cold and today it is raining buckets, but we are so glad it stopped snowing! It is one day after our MoonTree Exhibition and while I am glad that it is all over and I can stop bugging people about getting their pieces to Sharon or I, making cookies, demonstrating, etc. it was an exciting day as many of us got to display our art and talk to visitors that came to MoonTree to see our show. studio doing illumination demos and someone said to me that we were such a fun group. We already knew that, didn’t we! Also thank you to Connie Wendt, Sharon Esmont and Jo McPherson for making cookies for our Opening Reception and also to Connie, Laurie Henley, Lauren Matacio and Angela Michelutti for coming to MoonTree to support us and help get things ready. I appreciate all the work that all of you did for our exhibit at MoonTree and promise that I won’t email you regarding the exhibit……well, just a minute, maybe I can’t promise that because Sister Nancy would like us to exhibit in 2016, two years from now. So now I can start to hound you again about getting pieces created for our next exhibit! Here we go again! On April 12, Maureen, Laurie, Lauren, Renee, Marty, Pat, Connie and I took the 9 am train to Chicago to attend the Chicago Calligraphy Exhibit at the Newberry Library. We had a marvelous time drooling over all the beautiful calligraphy pieces as well as seeing Reggie Ezell, Valerie Weilmunster, Mary Jo Carney and our own upcoming instructor Julie Wildman, who was the recipient of the Newberry Purchase Prize. Afterwards we hoofed it all over Chicago walking to Paper Source and Blick Art Supplies. Our little tootsies were very tired by the time we got back to Millennium Station to take the train back to South Bend and we were glad to be able to sit down and rest them. Unfortunately, for many others, the train was packed with people returning to points east and finally South Bend and they had to stand for quite awhile until some of the passengers debarked. It was a very fun day and a warm one with the temperature reaching 80 degrees. On the train we also discussed what we wanted to “exchange” at the annual picnic in August. Maureen Trubac came up with an idea to make an accordion book, 4 x 4 or up to 4 x 8, with the theme being musicals or songs between 1950 and 1970. Create and have fun with it! 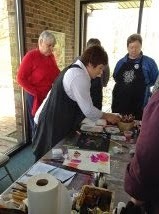 The end of April brought us mild temps and Julie Wildman for her Lively Letters workshop in South Bend. I especially love the white letters on black arches cover with some pastels, watercolor or colored pencils on them. We had a great time, as usual, and came away with more ideas to create at home. May 17 brought a group of us together to make paste paper all day at Christ the King Church in South Bend. 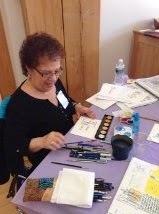 We are so blessed to have a place to play with our paints and paper all day together and a chance to talk about art. We all came home with some newly designed paste papers to use in different projects. Pat West demonstrated Sherri Kiesel letters at the June 7 meeting. She had several examples and distributed a page of letter forms. 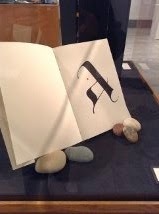 Sherri was in South Bend several years ago for a workshop on these letters that we still love. Thanks Pat for the great demonstration. And finally, the annual picnic will take place at the home of Ginny VanderHey on August 3, 2014. We will have a carry-in and a book exchange as mentioned above. Please let Ginny know if you will be coming to the picnic and what you will be bringing. Please remember to RSVP so we can make enough room for everyone especially if it is sweltering outside and we need to be inside!! Don’t forget your $15. in dues should be paid at the July meeting to Maureen Trubac, our treasurer. 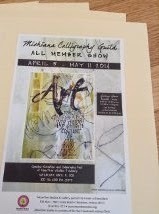 CCC, has an extensive graphic arts background and designed the logo for this year’s Newberry Exhibit. 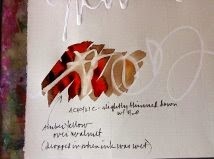 Her first calligraphy class EVER was Reggie Ezell’s year-long class in 1998. Julie’s enthusiasm for inventive and playful lettering set the stage for a very lively weekend. After a brief warm-up, we began a series of monoline exercises by first “distorting” our letters: breaking a rule from traditional forms and carrying that distortion throughout a word, phrase, or quote. Next, we bounced and rotated these letters, keeping in mind composition and negative space. For some of the monolines, we used a tool that was new for many of us--Sharpie paint pens in white, metallics, and a variety of colors. Next, we used watercolor to highlight areas and shapes within our pieces. Julie brought her Dr.
vibrant, flowing beautifully when dropped into our walnut inks. We continued to liven up our letters by making them spiky, alternating lowercase and caps, making them thick and thin, bold and light, extending ascenders and decenders, varying line space, using long joins, alternating tools. Moving on from strictly monoline tools, we used folded, automatic, pointed and ruling pens; pointed brushes; a cola pen and “straw” tool--for a scratchy, splattered effect-- which Julie had provided; and any other favorite nib or tool. Our next exercise experimented with two resist techniques using liquid gesso and white fluid acrylic paint, writing with each medium using fine tipped bottles on both black and white papers. After sufficient drying time, we experimented with different ways to add color to test the resist: pastels, gouache, acrylics, watercolor, watercolor pencils, walnut ink, sumi ink, and graphite--or a combination of any of these. As the day progressed, we played with design by “building” a vertical alphabet tower. Using construction paper, we tore or cut out the letters of the alphabet, looking at letters as shapes and placing each letter into the design with an awareness of the negative space we were creating. Julie’s last demo encouraged us to create a logo using our names. While creating a unified design, we were each to use each letter of our name to represent a different phase of our lives. As a result of this fast-paced, material-intensive workshop, we could share our experiments with the group in a Show and Tell with some wonderful inventive results. Throughout the weekend, Julie mentioned many of the instructors whose workshops and classes have impacted her approach to art. Now each of the ladies who attended can add Julie's name to the list of those who have enriched their journeys. Thank you, Julie! 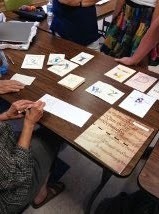 Michiana Calligraphy Guild met April 25 and 26 for a workshop with Julie Wildman, who presented her newly organized, "Lively Letters." And it certainly was a most lively weekend. Julie is knowledgeable and enthusiastic about her craft, and gave us many demos and examples of different ways to use our tools. She also brought samples of various mediums for us to try and new tools for us to try them with. We received exemplars of her alphabets as well as other fine calligrapher's exemplars and exercises to help us vary our own works. We will be able to spend many hours practicing these variations. I do enjoy her style and hope to bring a touch of it to my own projects. Doing what you do is Freedom. Liking what you do is happiness. We are currently looking at workshop instructors for next year. My mother always told me that “it’s nice to be nice” and that has resonated in my mind for many, many years. She always used to give a cold drink to the trash people on a hot day or take cookies to the ladies at the unemployment office which she saw quite frequently because of the seasonal work she did in the sweat shops. Recently, I received a request to write a poem on a mat board. Anne passed this client on to me and I thought I wouldn’t mind writing on mat board since I had just done four pieces for someone who wanted me to write two different languages theirs. I find that by doing something for someone else you get to practice your lettering and improve it in many ways. I told the client who wanted the poem on the mat board that I would be at our calligraphy meeting on Saturday and if she wanted to she could meet me there. She readily agreed since she lived in South Bend. The next day I spent a lot of time lining the piece of board with soapstone, which is what I use on dark paper since it rubs off so easily. It’s not as easy to make those lines come out as perfect as when you are using a Linex Liner, but it enables you to see lines and then erase them so no one knows that they were ever there. Next, when I finally got up my courage to write on the board, I took out my Dr. Martin’s Bleedproof White and wrote out the text. I wrote two lines and realized that when the Dr. Martin’s dried, the paint was cracking! Oh My Gosh! Now what will I do. I only received one piece of mat board and I could not in good conscience give it to someone who is paying me for my work. So I wrote to the client who was very understanding about it especially when I said that I would go and buy another piece of mat board and redo it. Where did she get it I asked and she said Hobby Lobby. Now I am thinking….great, I will take my 40% off coupon and not have to spend too much on a second mat. Only Hobby Lobby didn’t have any more of the color she had picked out and I had to order it. It would take another week and a half to get it and would cost $28 for the whole piece. They would only sell the whole piece if you had to order it and they didn’t have any scraps. So, now what was I to do? I talked to Pat West about where she takes her things to be matted and framed, and she said she recommended Thompson’s in downtown Elkhart. Come Monday afternoon, I head on down to Thompson’s to see if he has a piece of mat board anything like the color I have. I went into the store and no one was there, so I walked around looking at the art work and noticed where all the scrap pieces were. Still no one came to the front. As I was closer to the rear of the store, I saw someone sitting at the desk and said hello, walked closer and said hello. That was when I noticed that the man was fast asleep and didn’t hear a thing, so I waited until his cat nap was over and in the meantime I looked through the scraps and found two pieces that were very close to what I needed. When he finally came out, he asked if he could help me, but I said that I had already helped myself and wanted the two mats. How much will each piece cost? He said, “Give me four dollars.” You could have knocked me over with a feather. I took the cash out of my purse, gave him the money and went home to work on the mat board. To make a very long story short, I lined the mat board, wrote the Irish Blessing on it, cut it and cut out the piece for the photo that she was putting into the mat. I cut three sides and realized that my little mat cutter would not reach the 14 inches to cut the top of the opening. So, back again to the framer and he cut the one side of it for me. When I asked how much, he said no charge. I told him that I would pass along to my friends that he had scrap board for sale and did a good job at framing also.